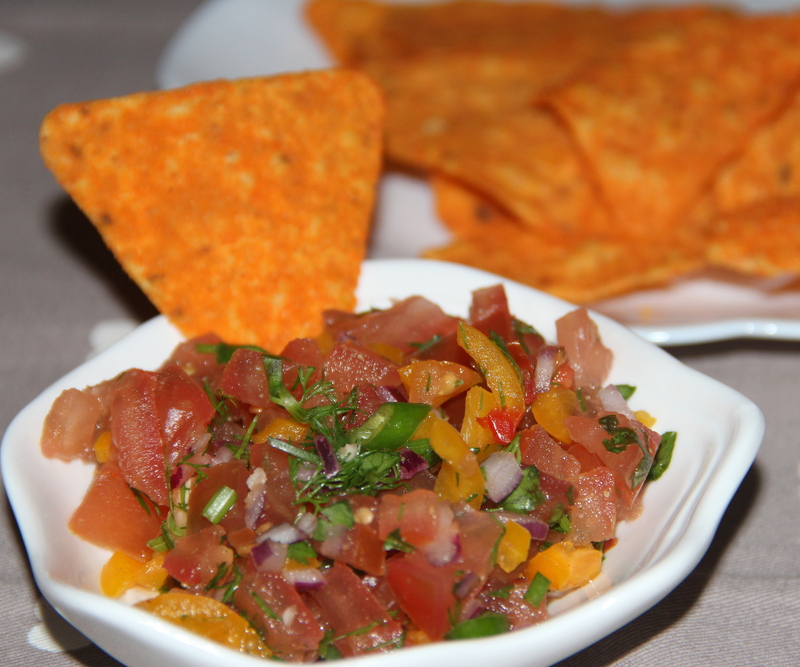 If you are looking to make a salsa with fresh ingredients, this recipe is perfect for you. This recipe uses fresh ingredients such as tomatoes, green pepper, onion, jalapeno pepper, cilantro and dill leaves. Used dill as I love its flavour in dip, to make a quick and delicious salsa. This salsa goes great with tortilla chips and it can be served on your favorite tacos as well. In a medium bowl add the tomatoes, green bell pepper, onion, cilantro, and jalapeno pepper. Add the lime juice, cumin, salt, and ground black pepper. Mix well. If you don’t like hot in your dips skip jalopenos. You may want to adjust the seasonings to your taste adding more or less cumin, salt and pepper as needed. If you are worried about the salsa being too spicy, you could seed the jalapeno peppers. Enjoy. Posted on November 13, 2014, in Dips, Dips, Indian, International. Bookmark the permalink. 35 Comments. Never thought of using dill in a salsa before. Sounds like it’s really good! I’ve never used Dill in salsa. Very intriguing! Pretty dish Chitra! Yum. I love salsa but have never thought of adding dill – next time l will! 😉 Wish you a great day too!! You have a yummy blog here. Nomnom. I think I have some serious issues since to me all ingredients are good for me, or i like too many ingredients of all kinds……. Yes it is, it´s worth the time when I make a little good plate for myself. Patience, you have to have with some of the plates as you well know, but´s worth it when it comes out good.